Why not??? Milk protein allergies and lactose intolerance have been linked to a wide array of physical symptoms. For some, it is as simple as lethargy or weight gain, for others crippling migraines and “autoimmune” type symptoms are a lifestyle complication. There is a great deal of research linking dairy to prostate cancer, breast cancer, type 1 and type 2 diabetes, obesity, high cholesterol, heart disease…have we got your attention yet? We’re not here to bash dairy. For some people dairy products may be completely benign, but for others, it can be a silent (or not so silent) killer. Check it out; see if a dairy-free or dairy-limited diet improves your quality of life. It has helped many of us, which is why we want to share this challenge with you. What is the worst that could happen? Absolutely nothing…you have no reaction, no change; you go back to your cheesy habits. What is the best that could happen? Your migraines subside, your cholesterol plummets, your energy increases, your body seems lighter, your stomach calms down, or you just FEEL BETTER. Tempting? Give it a try, it’s easy. Just about anyone! For those who may be allergic to milk or lactose intolerant (many more than you may think), it is essential that you consider a dairy-free lifestyle. However, even those who do not appear to have milk sensitivities may benefit through increased energy, easier more permanent weight loss, and increased muscle mass. We can hear a few hecklers out there hollering for more proof. 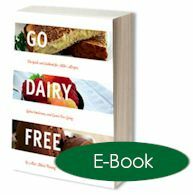 There have been numerous research studies which evidence the benefits of a dairy-free diet, and there have been some inconclusive ones as well. The fact is, we as humans share many common health traits, but we are all still individuals. The only study that can conclude what is absolutely best for your health is your own. Prove it to yourself! Just remember, it is always advised to speak with a doctor before any change in diet. If you have any health concerns, consult a physician. None of the information provided within this website should supersede the advice of your physician. When Should I Try It? Since it is only 10 days, you can try it virtually any time. However, there may be times that are easier than others. If you can, try to do the challenge during a period when your travel is limited, and when you do not have any scheduled family and friend food gatherings. 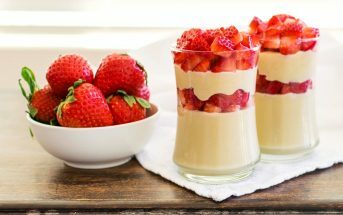 For the veteran dairy-free “foodie”, these occasions are no problem, but they can be tricky when you are just starting out. Browse this website for helpful tips throughout our extensive recipe, product review, grocery shopping, and dining guides. 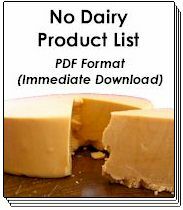 For some extra assistance, take advantage of our No Dairy Product Lists and Go Dairy Free, the premier guide and cookbook for transitioning to a dairy-free lifestyle. For your 10-day trial it is most important to take a break from the obvious offenders. This would include milk, cream, cheese, ice cream, buttermilk, and butter. Many components of these foods also linger under various chemical-like names in processed foods. Milk proteins and lactose have an amazing presence on the grocery store shelves! 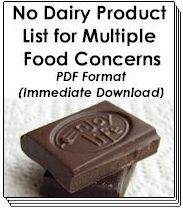 If you choose to strictly follow the Dairy Free Challenge, then utilize our food labels section for some very useful ingredient-reading information. At the very least, do a spot check on food labels for anything that sounds “creamy”, “milky”, or “cheesy”. Keep in mind, if you continue to ingest milk in smaller amounts rather than strictly cutting it out, milk-related symptoms and cravings may persist. How Do I Begin the Challenge? Jump ahead to the next tab for a Free Journal and more detailed information to help you get started! Begin your 10-day challenge on the best day for you. 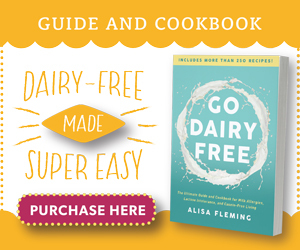 Browse our onsite dairy free guides for ample suggestions on substitutes, grocery shopping, dining out, and recipes, and check our Ask Alisa section for FAQ’s and to address your own inquiries. For additional guidance, see the recommended resources below. During each of the 10 days track how you are feeling in the Journal we have provided. Try to resist the temptation to “cheat” during this time frame. If you consume dairy before you have completed at least a 7-day dairy break, then resume the challenge from day one. Write in your Journal how you feel after breakfast, lunch, and dinner on the 11th day. Be sure to note what you have eaten during the day. Continue to keep a dairy for the next 3 days following your dairy free challenge. Now it is time to review your Journal carefully. It could reveal clues to any major or minor symptoms you may be experiencing. Head to the Results tab for help in the evaluation of your results. * Very Important: Please use caution when consuming dairy following this challenge. Limit your intake to a “normal” amount for yourself, based upon your typical dairy consumption in a day. If you are in some way sensitive to dairy products a large consumption could have strongly adverse reactions. As with any dietary recommendations, consult a physician before you begin this trial. 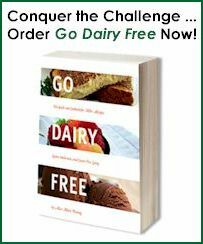 If you noticed significant changes between your dairy-free and your dairy-full days, then your body is giving you a big signal (a bright, red, flashing one) that you have an intolerance, sensitivity, and/or allergy to milk products. A dairy free diet may be your best option. It is easier than you think, and will quickly become a habit that you do not want to live without. Utilize Go Dairy Free as a personal resource guide. 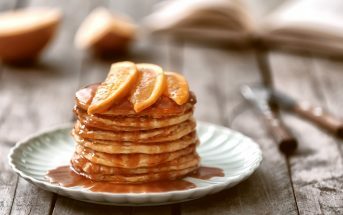 This site contains an abundance of useful information to address any questions or concerns, as well as recipes, menu ideas, and tips for eating out. After a few months, those dairy cravings will fade away, creating room for a healthier you to emerge. If you noticed some improvements, but no dramatic swings, then you may still wish to consider a dairy free or dairy limited lifestyle. Any differences, no matter how large, do indicate that you are having some type of physical response to milk products. These small changes may also indicate a more dramatic internal change, which may not be apparent immediately, such as a reduction in cholesterol or a kick started metabolism. Consult your physician, and consider continuing the dairy free lifestyle for 3 months. If you discover more health improvements, great, keep it up! If you opt to add moderate amounts of milk products back into your diet, check our page on the Dairy Rotation Diet for some healthy suggestions. Diseases & Conditions – If you did not see significant external changes on the challenge, but you are suffering from conditions related to heart disease, such as high cholesterol, or other long-term ailments such as hypothyroidism, then your doctor might advise you to stick to the dairy free challenge for at least 1 to 3 months. Coincide your blood tests with the challenge; in order to have your cholesterol and thyroid levels checked near the end of your extended challenge, but not before you hit your dairy day. Do not be surprised if your cholesterol and/or thyroid levels mysteriously drop a bit. It has been known to happen! Support of Loved Ones – Do you have a family member who may be lactose intolerant or allergic to milk? It is much easier for a person to stick with a diet if they have the support of their family. Consider altering your in house eating habits to avoid tempting a dairy-free loved one, and to help them enjoy a well-balanced diet. Personal Reasons – Some feel that the consumption of dairy is “unnatural”. They may be right. After all it was a food added to our diets through industrialization. Our society seems quite content in consuming the milk of another nursing mammal, yet we consider it dangerous to consume our own species breast milk past infancy. General Health & Social Responsibility – We lump these two together as they both arise from a similar issue. Today’s “processing” of milk and the environments in which it is induced are un-natural to say the least. Some people choose to cut out milk due to the strong social issues it brings up. While others feel that the use of added hormones and antibiotics as well as homogenization and pasteurization creates an unhealthy product for human consumption. If you have worry, check out our All About Milk and Health Concerns sections for more extensive information and resources. Ask your doctor about obtaining an allergy blood test or an in office lactose intolerance test. Don’t ignore food sensitivities. Full-blown allergies are not required to wreak havoc on our bodies. Check back… we will be adding information on allergy and intolerance testing in the near future. What About a Dairy-Low Diet? If you opt to consume dairy in any amount, consult our section on the Dairy Rotation Diet for recommendations on the healthiest ways to do so. In the end, it is your own body, health, and quality of life that you must consider. If you noted any type of dairy reaction after completing our challenge, then your body may be sending you a clear message that dairy may not be the best food for you. Disease and illness typically manifest in us over time. Even those ailments, which may come on suddenly, are given an open door from a weakened immune system. Limiting or eliminating dairy from your diet may be a very wise move in the long run. Not to mention, isn’t it nice just to feel better every day. Check with your physician to find out if a dairy-free or limited lifestyle may be beneficial for you. *Always consult a physician before undergoing any change in diet.